AbstractKeywords: cultural diplomacy; 14th October; Kraljevo October; mass shooting. AbstractKeywords: digitization of Bulgarian early printed books; meta-data representation; linked digitized data; digital content analysis. AbstractKeywords: distributed computing; grid computing; meta computing; global computing; peer-to-peer computing; MapReduce paradigm; image processing; digitalization. 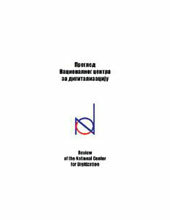 AbstractKeywords: astronomy in Serbia; electronic publishing; digitization; Belgrade Astronomical Observatory.